Genuine OEM Konica Minolta MS5B Staples. They are designed to work in the Konica Minolta Di450, Di520, Di550, Di620, EP 2050, EP 2080, EP 3000, EP 3050, EP 4000, EP 4050, EP 5000, EP 5050, EP 6000, EP 6001, EP 8015 printer/copier(s). Genuine OEM Konica Minolta 950764 Staples. They are designed to work in the Konica Minolta 7033, 7040, 7045, 7050, 7055, 7060, 7065, 7075, 7150, 7155, 7210, 7255, 7272, Bizhub 600, Bizhub 750, Bizhub C451, Bizhub C550, Bizhub C650, Bizhub Pro 920, Bizhub Pro 950, Bizhub Pro C5500, Bizhub Pro C552, Bizhub Pro C652, Bizhub Pro C65HC, Di250, Di250F, Di251F, Di350, Di350F, Di351, Di351F, Di450, Di550, Di551, Di620, Di750, Di850, EP 8010, FS-103, FS-103A, FS-103B, FS-104A, FS-106, FS-108B, FS-115, FS-215 printer/copier(s). 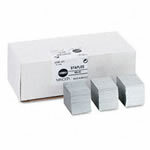 Genuine OEM Konica Minolta 950974, MS10A Staples. They are designed to work in the Konica Minolta Bizhub 601, Bizhub 751, Bizhub 850, Di7210 printer/copier(s). Genuine OEM Konica Minolta Staples. They are designed to work in the Konica Minolta 3135, 3233, 3240, 4065, 4145, 4155, 4345, 4355, 5080, 5370, 5370M, 6090, 6190, 6190M, 7490, ST-207, ST-208, ST-211, ST-217 printer/copier(s). Genuine OEM Konica Minolta Staples. They are designed to work in the Konica Minolta 1015, 1018, 1120, 1216, 2020, 2028, 2125, 2130, 2223, 2230, 2330, 3035, 3135, 3240, 3340, 4045, 4145, 4155, 4255, 4345, 4355, 7050, FS-102, ST-103, ST-205S,ST-206, ST-210, ST-216 printer/copier(s). Genuine OEM Konica Minolta 14YH Staples. They are designed to work in the Konica Minolta Bizhub Pro 1050E, Bizhub Pro C6500, Bizhub Pro C6501, Bizhub Pro C65HC printer/copier(s).